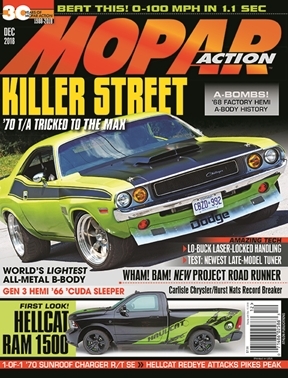 Mopar Action is the best-selling Mopar enthusiasts’ magazine on the market today. Mopar Action covers the entire world of Chrysler, Plymouth and Dodge vehicles, including classics, muscle cars, race cars, new car road tests, performance tips, technical advice articles, personality profiles, coverage of major Mopar events, restoration advice and club news from around the world. If it’s Mopar—you’ll find it in Mopar Action.